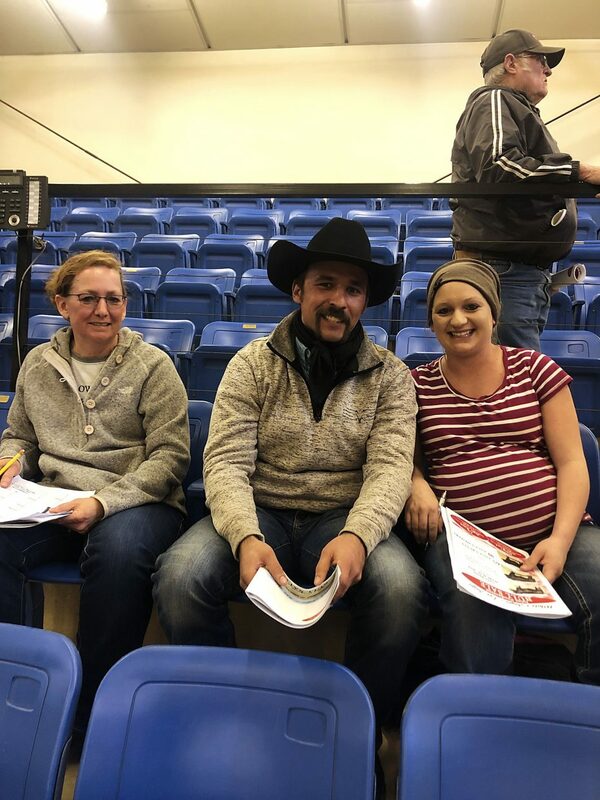 Yolanda Martin and Brady and Miranda Harkless from Buffalo, South Dakota. 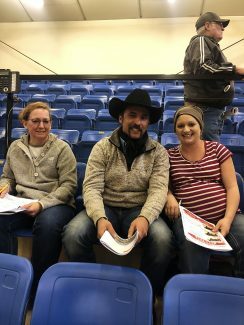 Optimism was felt throughout the entire crowd on a much-needed, nice and relatively warm day, March 16th, 2019 at the joint production bull sale of White and Lee Angus. Congratulations on a great sale! Lot 12 at $5,500, White's Impressive 841, DOB 3/9/18, REG#19281647, MOHNEN IMPRESSIVE 1093 x SUSIE 621 WAR, sold to Wes Miller from Rhame, North Dakota. Lot 43 at $5,250, Lees Prime Cut 8106, DOB 2/24/18, REG#19302244, HA PRIME CUT 4493 x SHOBANDA 6103 LAR, sold to Todd Hall from Dunn Center, North Dakota. Lot 28 at $5,000, Lees Cowboy up 8206, DOB 3/19/18, REG#19341368, HA COWBOY UP 5405 x SIERRA 503 LAR, sold to Wes Andrews from Bowman, North Dakota. Lot 1 at $5,000, White's Cowboy Up 802, DOB 3/14/18, REG#19281627, HA COWBOY UP 5405 x FANCY LADY 502 WAR, sold to Sam Juntunen from Amidon, North Dakota. Lot 3 at $5,000, White's Cowboy Up 859, DOB 3/17/18, REG#19281651, HA COWBOY UP 5405 x POLLY 359 WAR, sold to Daryl Dennis from Amidon, North Dakota. Lot 40 at $5,000, Lees Prime Cut SHL 805, DOB 3/16/18, REG#19302233, HA PRIME CUT 4493 x ERICA 3112 LAR, sold to Tony Pierce from Bowman, North Dakota. Lot 45 at $5,000, Lees Prime Cut 8130, DOB 3/6/18, REG#19302249, HA PRIME CUT 4493 x ERICA 262 LAR, sold to Daryl Wallman from Rhame, North Dakota. Lot 50 at $5,000, Lees Counselor 8117, DOB 2/27/18, REG#19302247, A A R COUNSELOR 5546 x PAULA 6146 LAR, sold to Daryl Dennis from Amidon, North Dakota.